Sciblogs | The mother of all languages? The mother of all languages? I keep a fairly close eye on where New Zealand science is covered in the international press. 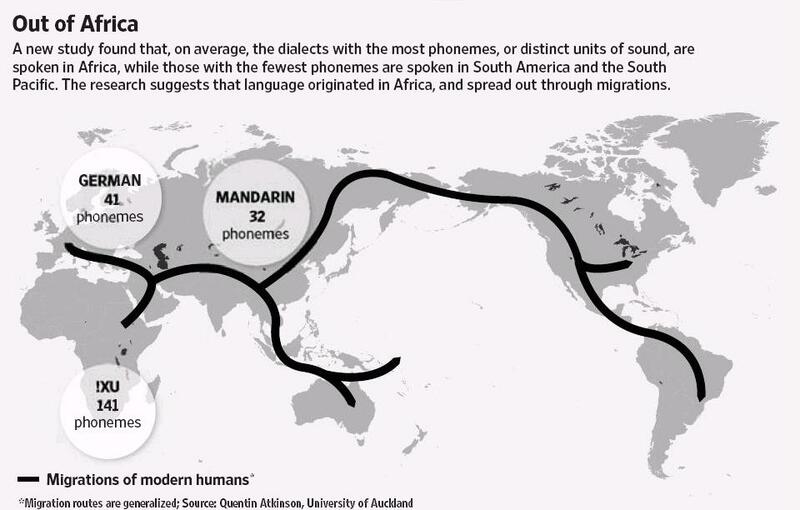 So it was good then to see University of Auckland psychology lecturer Dr Quentin Atkinson featured in the Wall Street Journal and other major news outlets for his paper published in Science last week which suggests that our modern languages may have all descended from a single ancestral tongue spoken by early Africans between 50,000 and 70,000 years ago. The research is a bit controversial as are many of the theories put forward by evolutionary psychologists because they are often difficult to test properly. Atkinson computer modelled 504 modern languages, looking specifically at the number of phonemes – distinct units of sound, that are included in each language. He found that the further away from Africa he went in search of language, the less phonemes the language had – Pacific island languages had the least, as did South American languages. The idea is that languages tend to start out with more sounds in them, then become less complex as people migrate away and settle in smaller groups. The research results mirror those reported in the world of genetics with analyses showing that African populations have higher genetic diversity than European, Asian and American populations. But some scientists are wary of settling on the mother tongue theory given the diaspora out of Africa happened so long ago. Which is why the Dominion Post on Saturday described Atkinson as having been “thrust into a global media storm” with the publication of his Science paper. In a separate article on Stuff, Michael Field covered some of the other sceptical comments from scientists such as Bart de Boer, a linguist at the University of Amsterdam. An infographic from the Wall Street Journal that illustrates the change in linguistic diversity as you move out of Africa. I haven’t read Dr Quentin Atkinson’s paper (just for curiosity only), but I suspect that his work (with colleagues) is similar to the work by the authors shown in the paper below, although the paper below only simulates the competition between different existing languages. Dr Quentin Atkinson’s coauthor Prof. Mark Pagel for their paper, Languages evolve in punctuational bursts (theme of this blog post), his work is cited in the paper above. Another related one, using complex network theory (which is really a domain of SciBlog blogger Shaun Hendy). It was a bit sad that not one NZ media outlet worked out the link between this paper and Allan Wilson: a kiwi and one of the first people to use comparable genetic evidence to show the we all had our start in Africa. The one weird thing is that he has points that are over 25,000 km from Africa (Fig. 3), which is more than half a great circle. Maybe he’s using something like migration distance but I didn’t see anything in the article to that effect (I read it in ten minutes, so I might have missed something).